In a post earlier this week, I asked how paradise was manifested in early Christendom. 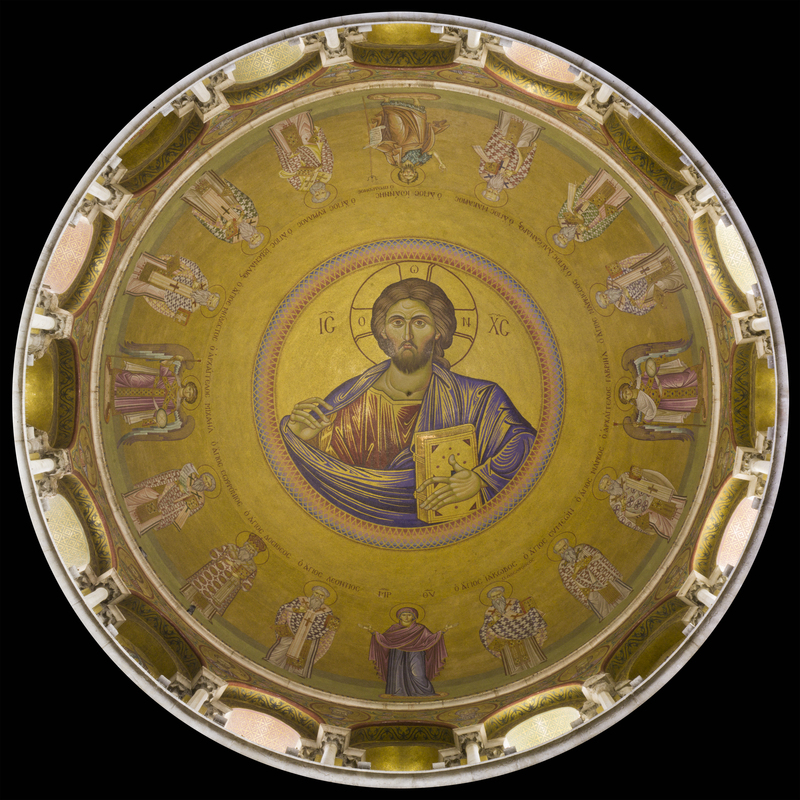 To illustrate, I described the convention within the eastern Church of building temples with a central dome within which an icon of Christ Pantocrator was painted. The effect was that worshipers looking up into the dome experienced “heaven on earth,” or paradise. The original model of the Christian dome was the cathedral of Hagia Sophia in Constantinople, the largest church in the world when it was rebuilt by Emperor Justinian in the sixth century. (By the way, this became the model for Muslim architecture as well, which began to proliferate after the conquest of large parts of Christian Byzantium during the following century and culminated with the actual conquest of Constantinople in 1453, when Hagia Sophia was first desecrated by the Muslim conquerors and then converted into a mosque–to hear that story, readers can listen to my podcast episode about it here). 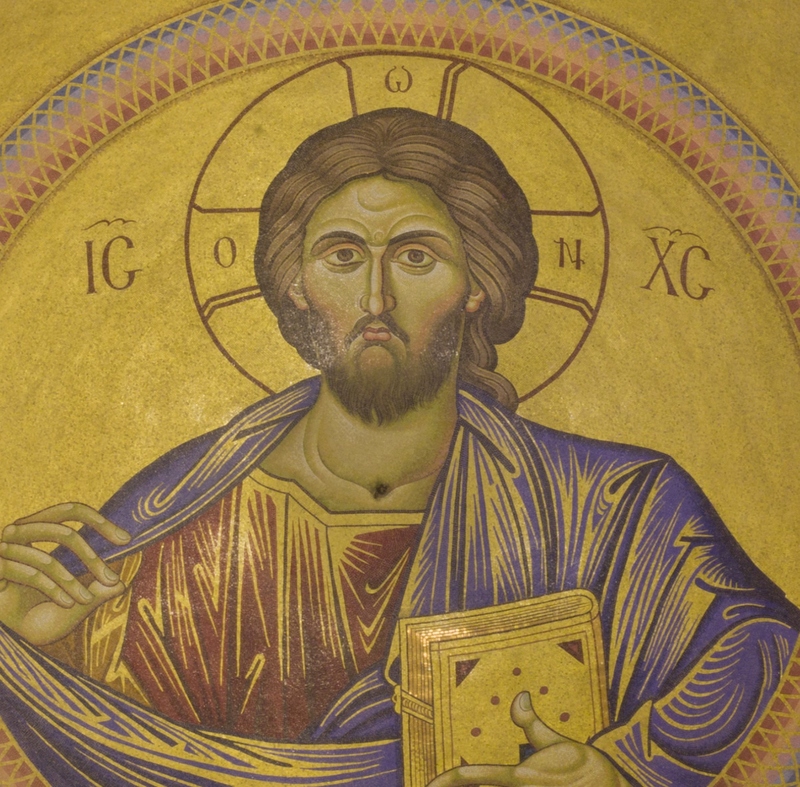 In the centuries that followed the construction of Hagia Sophia, paradise continued to be experienced in the world through Christian worship and the liturgical art that accompanied it. However, in the nineteenth century, at the close of the American Civil War, another building with a huge central dome was being completed: the United States Capitol in Washington, D.C.
What a difference a millennium makes! 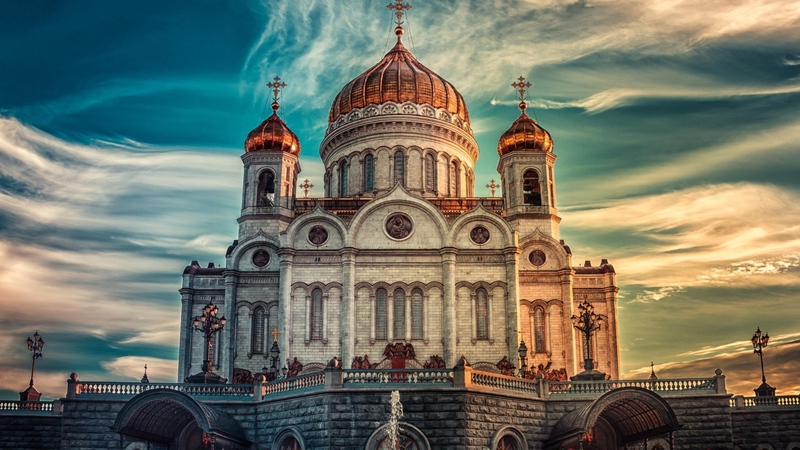 On the one hand, the Capitol building grew out of the tradition within Christendom of erecting monumental structures with central domes within which icons, or “images,” were painted. In this case, however, the design for the image was motivated by modern Christendom’s alternative to paradise, utopia. The painting can be seen by any tourist to (or resident of) the nation’s capital to this day. Standing within the famous rotunda below, a proud citizen or respectful foreigner gazes up one hundred and eighty feet into this most symbolic of American domes to behold the image of . . . George Washington. One is tempted to call it “George Washington Pantocrator” because in addition to appearing in majesty as Christ did in early Christian dome icons (the right hand is even outstretched as if in blessing), the first president is surrounded by figures emphasizing the greatness of America and her power to build a perfect civilization on earth. Farming and industry, science and commerce: the whole range of earthly potential is celebrated. A personified War even appears there, wielding a sword against the nation’s enemies as did the Archangel Michael against the Church’s foes in ancient Christian iconography. It is a good example of modern Christendom’s secularization of paradise. 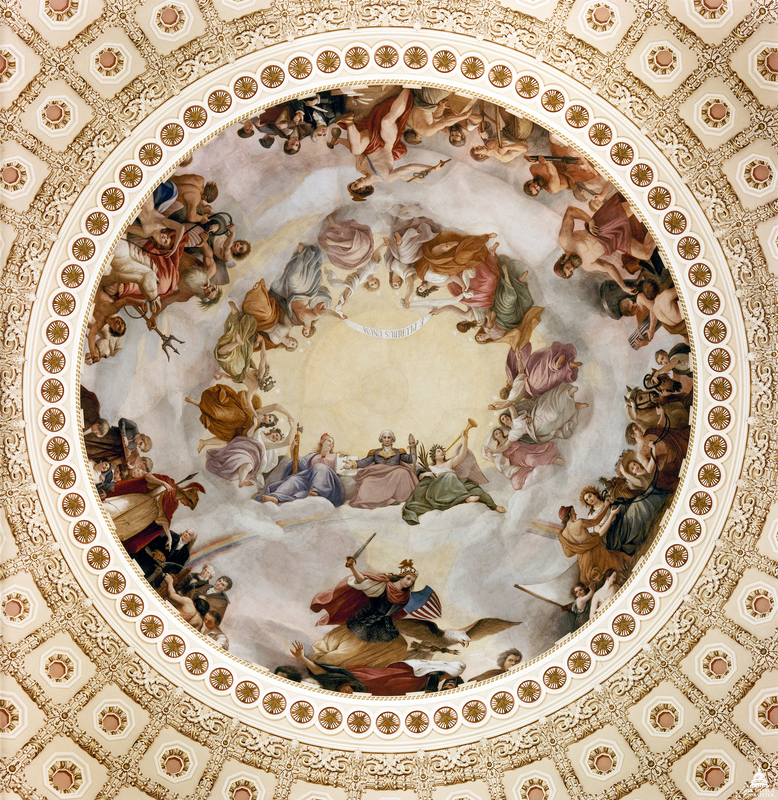 What is also of much interest is that the actual title of the painting is The Apotheosis of George Washington. One translation of apotheosis (from the Greek word for deity) is “deification.” It is the word that was used by the pagan Roman state when it claimed its departed emperors were gods and called upon Christians, among others, to worship them. 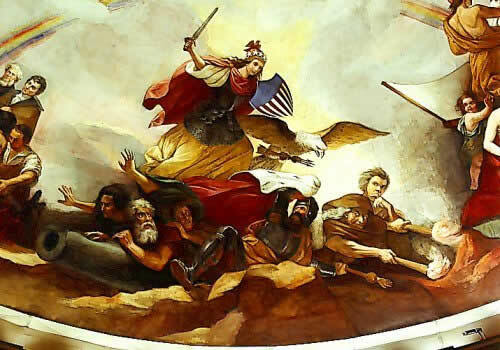 What does this fascinating painting within one of our nation’s most famous buildings say about the Christian heritage of American civilization? So What’s with the Women? This blog is about the history of Christendom, so what’s with the curious-looking women in the header’s image? Well, these are very special women and they have a great deal to say about the content of my blog. They adorn one of the most famous temples in Christendom, and one that brings both its eastern and the western halves together in a common experience of paradise. It is the Basilica of Saint Appolinare the New in Ravenna, Italy. Listeners of my podcast already know of its importance in the history of western civilization’s architecture and painting. (If you haven’t listened to that episode, you can do so here). It was built in the sixth century by the western Ostrogoth King Theodoric the Great but consecrated in the time of eastern Byzantine Emperor Justinian (who proved to be even greater). These women are also noteworthy because they are, after all, women. Christendom transformed ancient society’s attitudes toward women, elevating them according to traditional Christianity’s standards of sexual dignity and the value of the human person, female as well as male. (You can listen to my podcast on this topic here).Sharing equally in “the image of God”–that essential feature of the traditional Christian vision of humanity–they are depicted here standing equal to and not behind a matching image of men on the wall opposite to them. They hold crowns of glory in their hands. But most importantly, the image I chose for the blog’s header features one of the most explicit statements about the core experience of Christendom. These women have a purpose. They are going somewhere. What is their destination? The iconographer who depicted them, by integrating his work with the very architecture of the temple, subtly directed their bodies toward the altar area at the easternmost part of the building (to the right of the image we see). The women are therefore oriented, which literally means “facing east.” That is their destination. And not just that, but facing east and moving in its direction they are experiencing paradise, because according to traditional Christianity (and Judaism) paradise is planted in the east (Gen. 2:8). Living in this world, they belong to the kingdom of heaven which is not of this world but which has broken into it and is already present within it. They live in paradise. This is the core experience of Christendom.